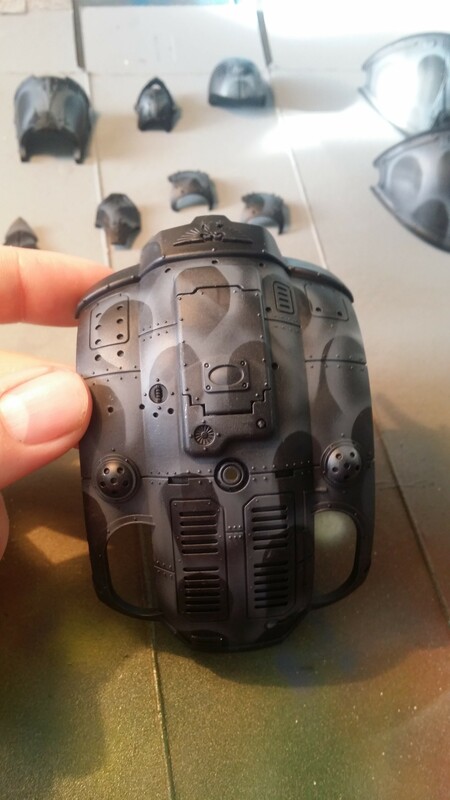 #warmongers #miniswap 2014 is GO for launch! Well the deed is done #warmongers, I’ve just sent out the pairings emails for the 2014 round of the #warmongers #miniswap! 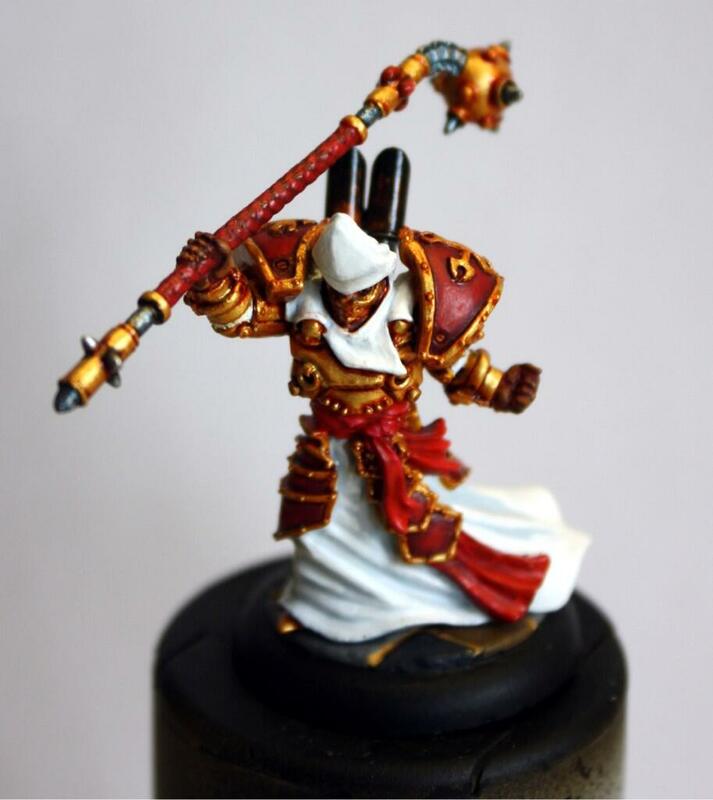 18 lucky people are now paired up and will be sending each other a lovely miniature (just the one mind, this isn’t a regiment painting service! 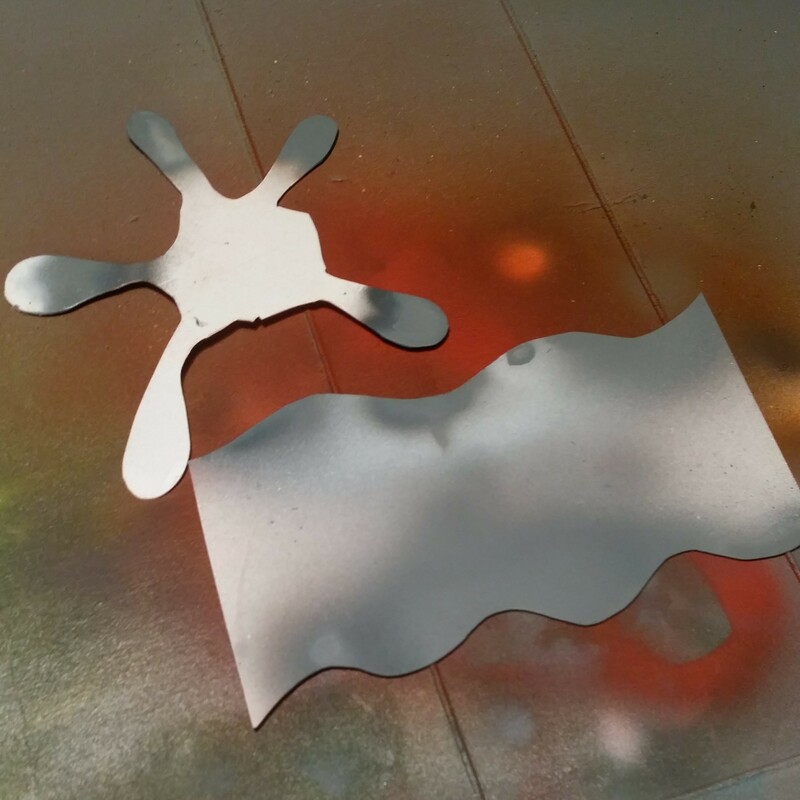 ), to apply some paint to. Cheer them on when you see them talking about it on Twitter, prod them for progress if they aren’t! One of the most spectacularly wonderful things about being a geek who games is being part of a wide, vibrant and varied community that organises some brilliant events. We’ve got Adepticon on right now and Salute in a week or so, and this Saturday, 5th April it is International Tabletop Day. “What is International Tabletop Day Rob?” I hear you all cry. Well, gather round and I will tell you a tale of valour and intrigue, oh wait, wrong blog post. Sorry about that, where was I? 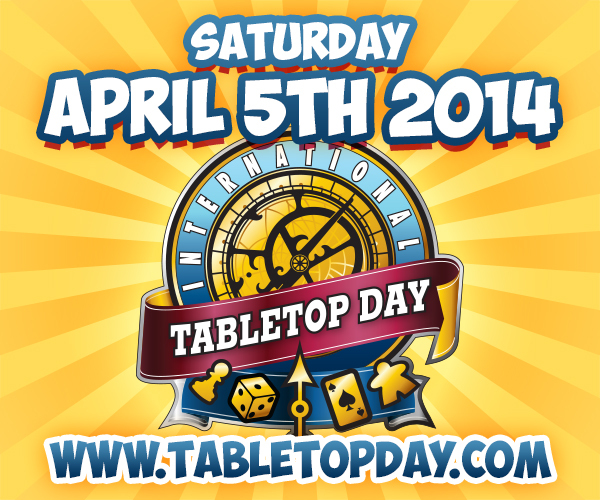 Oh yes, International Tabletop Day. Well in a nutshell it’s a world-wide tabletop gaming extravaganza, where anyone who wants to can organise and register an event through the Tabletop Day website. The site then serves as a really clever discovery tool for anyone wanting to find an event local to them. There’s a great map-driven interface so you can see whereabouts all the events are near and far and find something that will entertain you for the day. I, for example, happen to be in Munich for the day and a quick search reveals that there will be two events local to me, one organised by the “Toytown fan group” and the other at a place called “Funtainment”. I will be trying my level best to get to one of them just to see what’s going on and join in the gaming fervour. At the very least I’ll be taking a couple of games in my luggage to play with my family; my daughter is hooked on Labyrinth at the moment and I think I’ll be slipping my copy of Boss Monster in there as well. Phil and Mat will be X-Winging it up all day and they’ve registered their event through the site, so go find them and shout ‘pew-pew’ noises in their general direction, they’ll bloody love it. Mat also said he’s going to try to spread the good word about the hobby a little closer to home by teaching his wife how to play Dreadball. 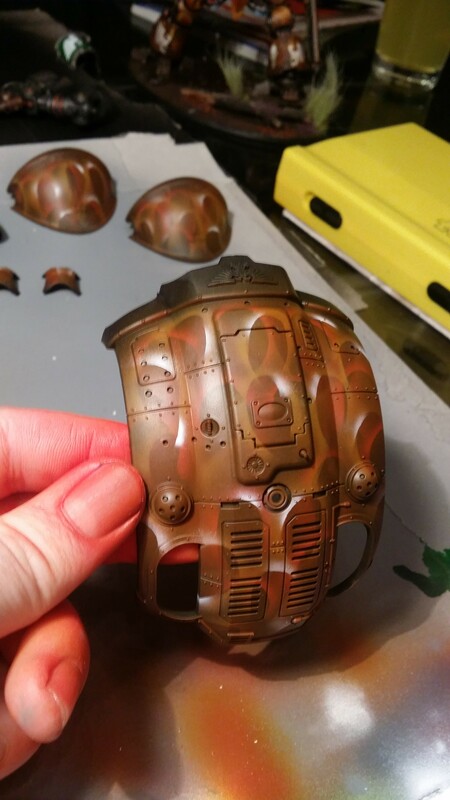 Anything that encourages understanding and appreciation of the hobby (and potentially gives you more freedom to spend!) is all part of the fun of the day. Ashley is of course already caught up in the mega-maelstrom that is Adepticon (she laughs at our one-day gaming feebleness! 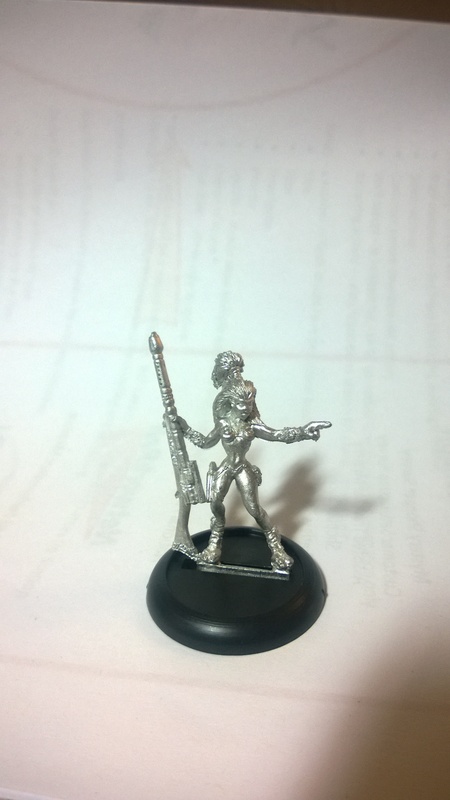 ), and will be playing Necromunda, or Saga, or Lord of the Rings. Or all three, though presumably not simultaneously. 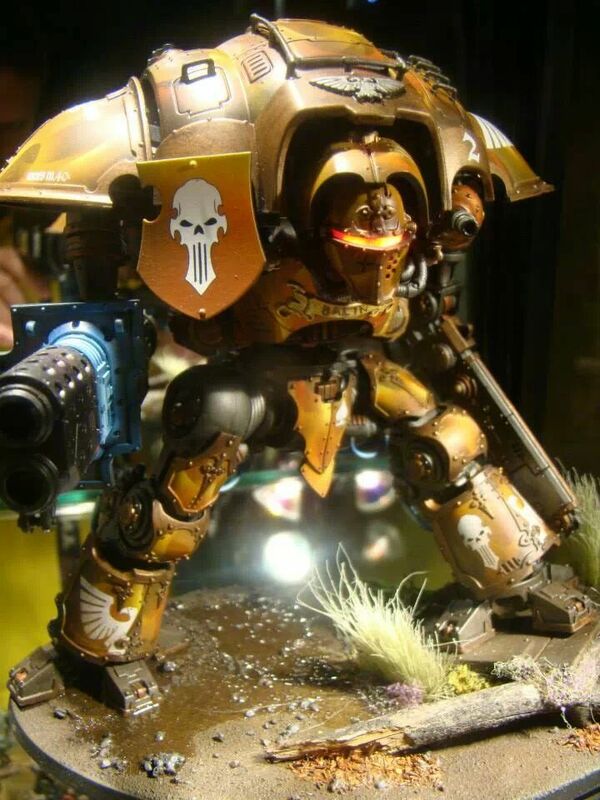 I assume that Adepticon (it is registered on the site) will be the largest playing group on the day, would be interesting to get the official word from the organisers on that front. Reece informs me that he’ll be starting out his celebration of all things tabletop by doing unspeakable things to his washing machine. Rock and roll. Sounds like the afternoon will definitely improve the awesomeness quotient of his day with a spot of painting Lizardmen with his wife and then rounding the day out with a bunch of friends playing Zombies and Space Hulk – now that’s more like it! So far there are over 2,300 events registered world-wide, which is seriously impressive, including well over 250 in the UK. So, if you’re hitting up your FLGS on Saturday, get them registered on the site so that the world knows you exist! Follow events as they unfold by looking up @TableTopDay and @GeekandSundry on Twitter and lots of folks seem to be using the #TableTopDay hashtag already. I love stuff like this, it reminds me just how huge our community is, and how wide the range of options is for participation in tabletop gaming. It also shows the world and celebrates what a social and sociable group we are and that we have bags of enthusiasm for welcoming new people into the gaming fold and dragging those who are already playing one lot of games into intriguing and exciting new gaming formats. 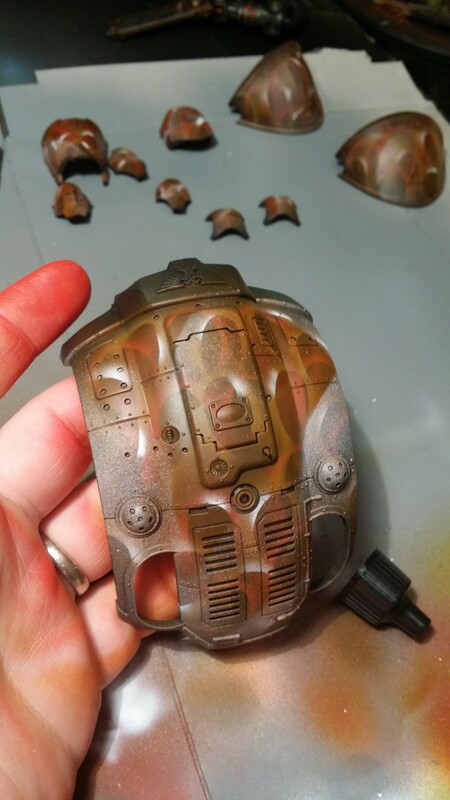 No, I haven’t been replaced by an imposter, I just have an urge to paint my Sorylians. 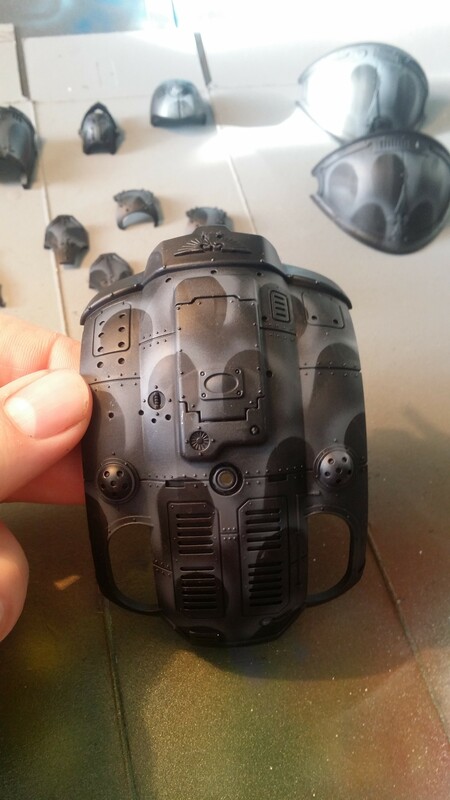 The problem I have is I don’t know what colour scheme I want to paint them in. 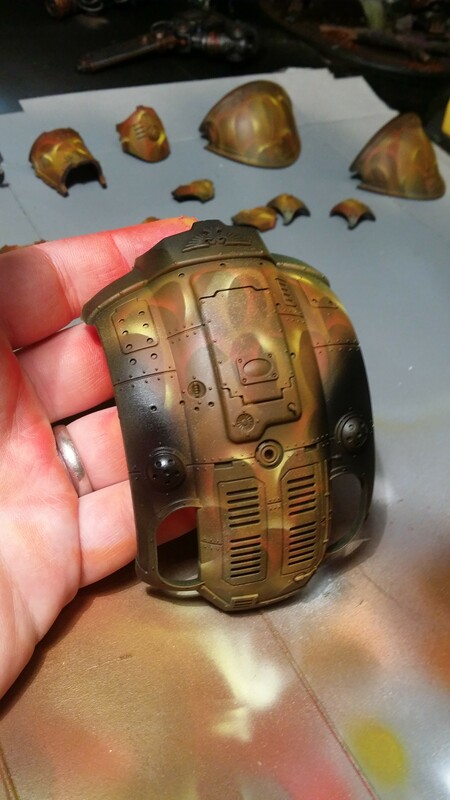 There’s no shortage of colour schemes out there, and I did blog about this a while back with ideas of basing the colour scheme on insects or reptiles. Although those ideas are admirable I don’t have time, or the desire to be honest. 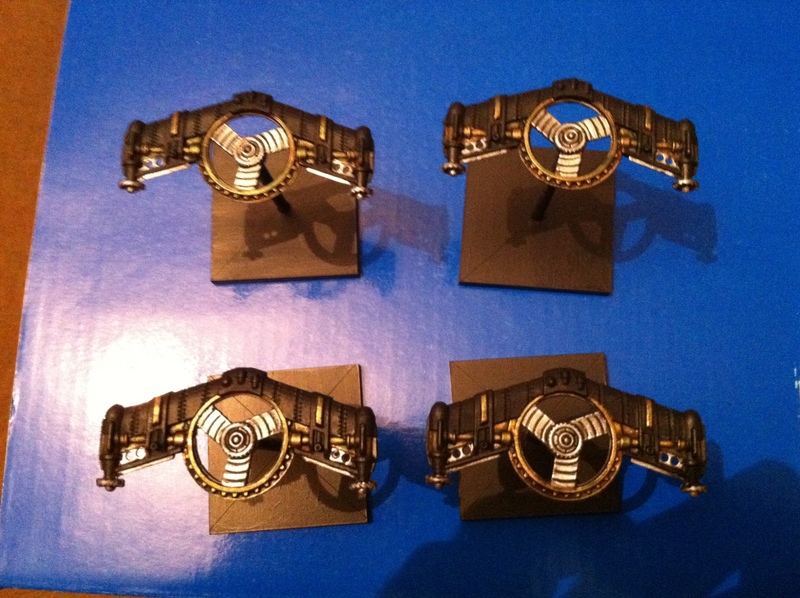 Thus the question is; what colour do I paint them. I’ve seen a couple of schemes I like, either as a concept or something to copy. But I can’t decide so I throw it open to you, my loyal readers, to help me whittle down the options. 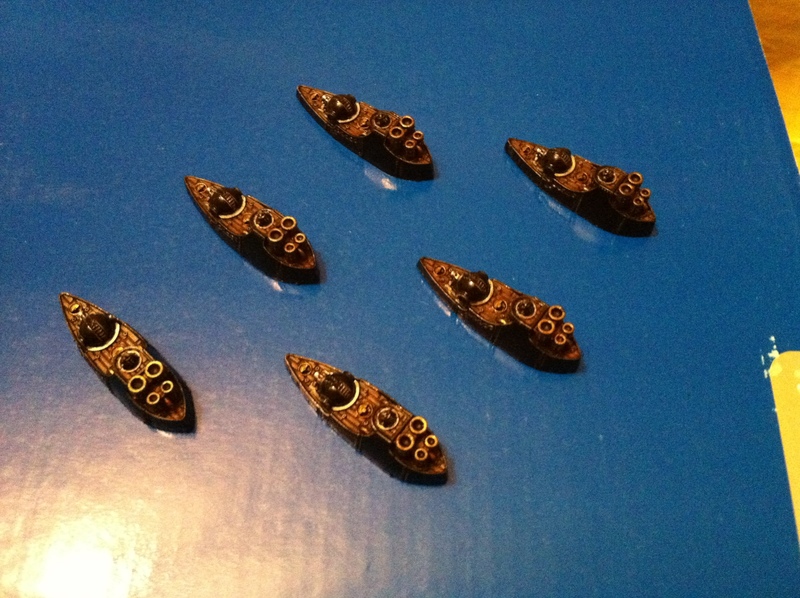 Once it’s been decided I’ll write background to it, as one would expect and in keeping with my 5th company Ultramarines and 5th company CoA fleet for Dystopian Wars, this will be the 5th fleet of the Sorylian navy. Have a vote below and, you never know, I might actually listen to you. 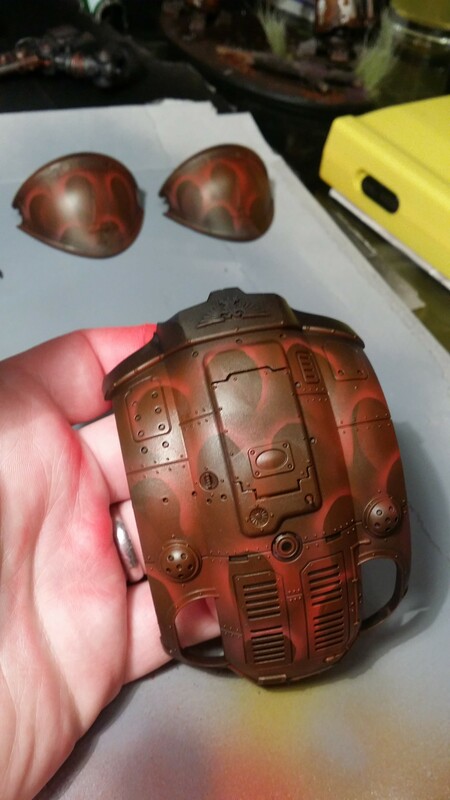 Those awesome chaps over at Hitting on 3s have posted a tutorial on how to do lava bases. It’s so impressive I just had to share it. You should check them out too, it’s a great site. Back in May I wrote some fluff surrounding my Covenant of Antarctica fleet – The Night Watch. My intention was to give my fleet an identity but also inspire me to actually paint something. 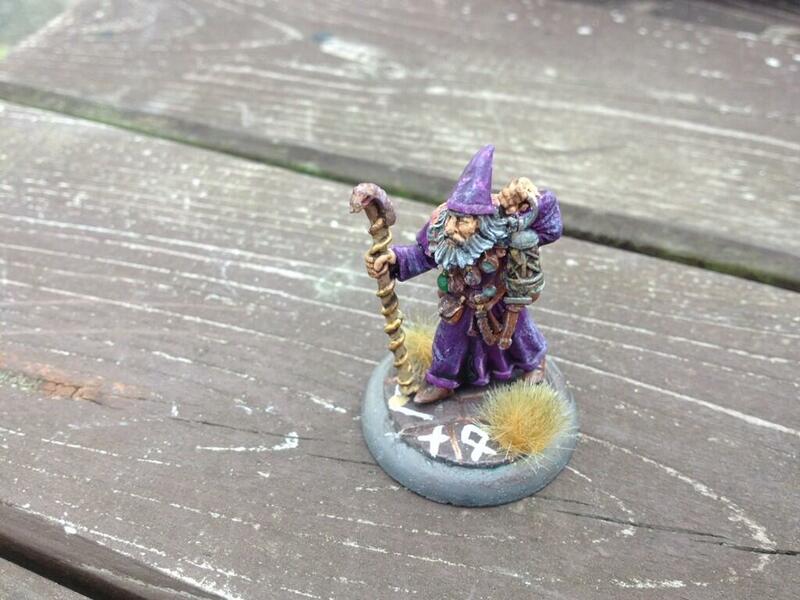 Well it must have worked because last Saturday I actually painted something. The Battleship known as Sword of Truth which I wrote about here. 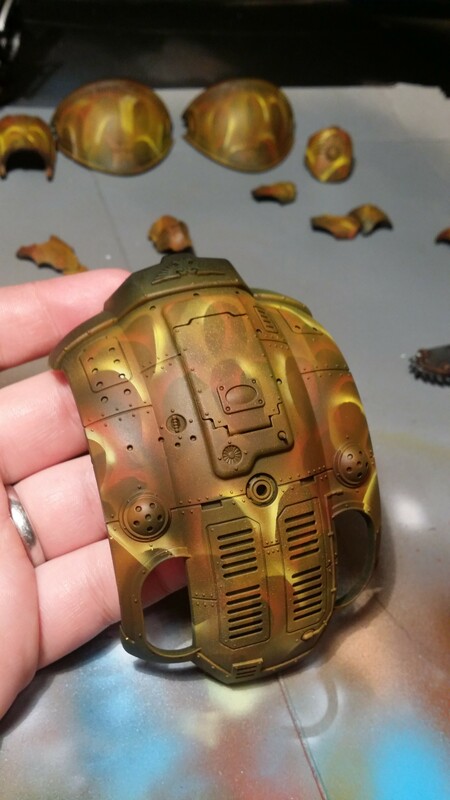 I half expected myself to run out of steam and paint nothing more. But something quite remarkable has happened which is that I’ve kept painting! 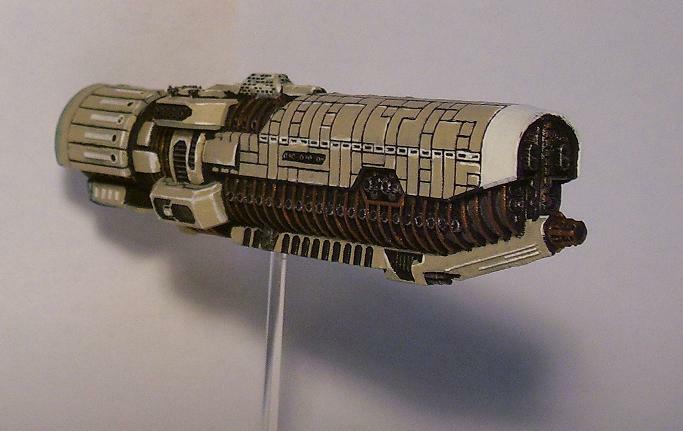 Next I painted 12 frigates, known as the Coppertails. I wrote about them here. 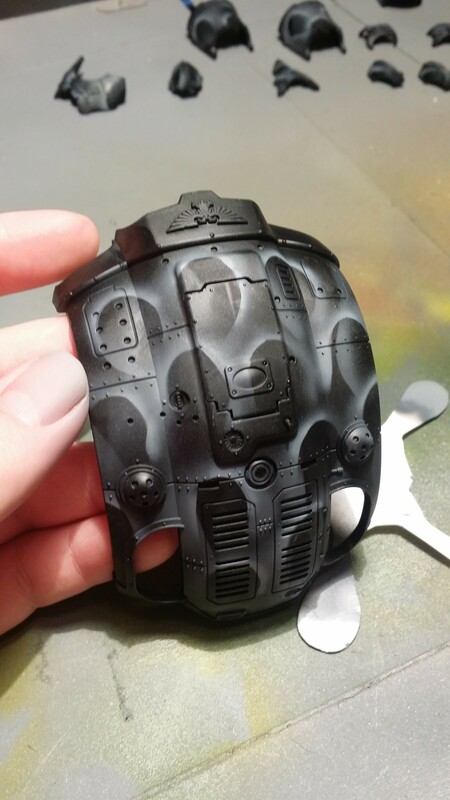 Now, I subscribe to the pleasure/pain principle of painting which is for every regiment/large unit I paint I reward myself with painting something more elite or a character. That way I’m incentivized to get the big units, and therefore most of the force, done in a relatively short space of time. 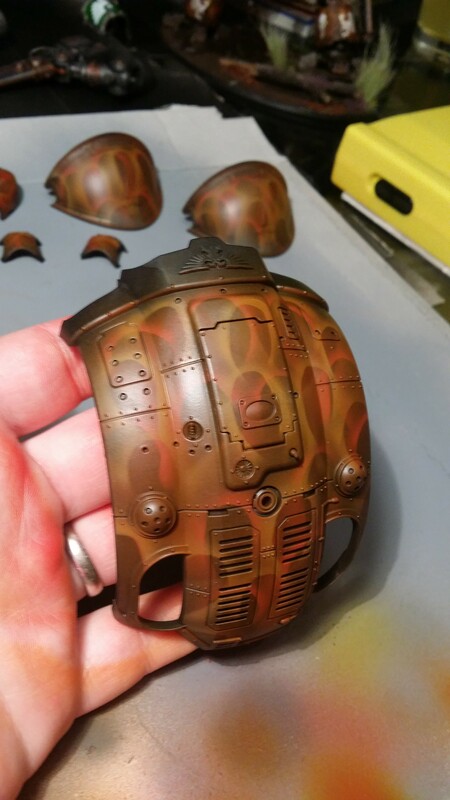 Following on from those, on Friday night I got my Cruisers painted (fluff post to follow). 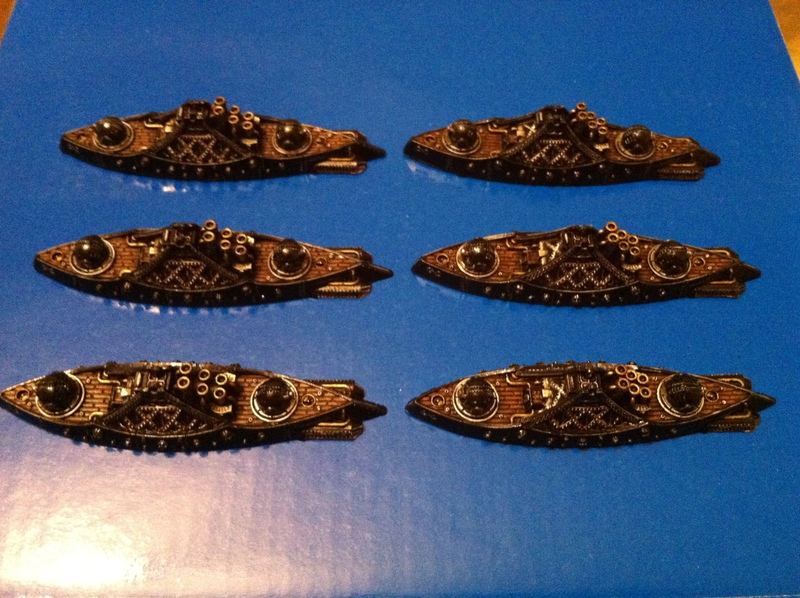 It was very rewarding getting these models done as they form the backbone of my fleet. Completing them made me feel like I was making real headway. Next up were the Escorts which I painted late on Saturday night. I’m pretty sure at one point I fell asleep. I couldn’t see any brush strokes that had gone awry. I blame entertaining my young nephews for the day. And trying to write my Prussians blog post at the same time. So Skyhammer and Cold Reason squadrons are both ready for deployment. And, again, a fluff post will follow. And finally, I’ve been working on four bombers this evening. All I’ve got left to do is give the black parts and ink and a highlight and then they’re done. As with the rest of the fleet I’ve tried to keep Nighthawk squadron’s colour scheme nice and simple. Simple isn’t bad though. Simple has meant that I’ve managed to get a big chunk of the 5th fleet done, leaving only 3 armoured cruisers and 3 large captial ships. I can’t promise that I’ll be able to keep up with the painting, but I’ll do my best. I’m certainly enjoying it. And I may have even done enough this week to earn myself one of DocBungle’s blue badges. A painting one, not a disabled one. Hmm, not doing too well on this front. I partially painted a venerable dreadnought and a chaplain. 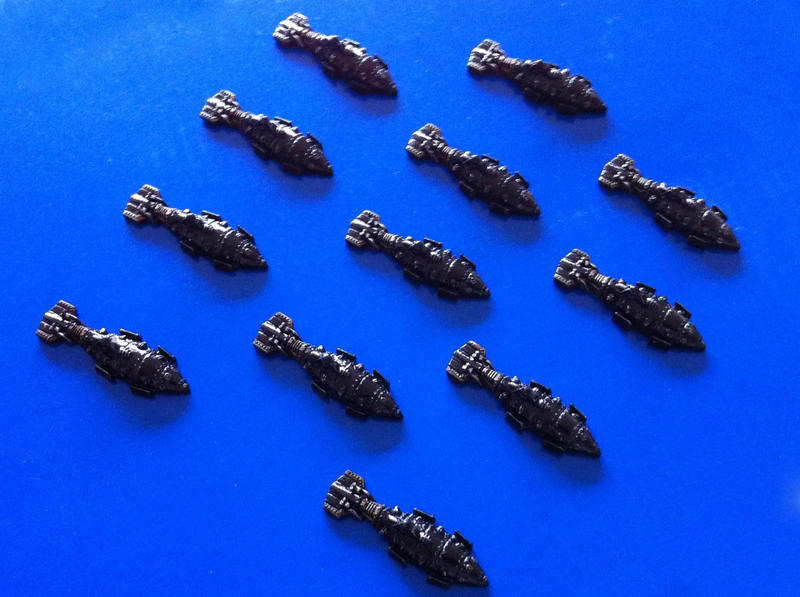 I’ve managed to undercoat my Covenant of Antarctica fleet but I wouldn’t say that really counts. Although I have another scenery review in the pipeline so I shall have to paint that. 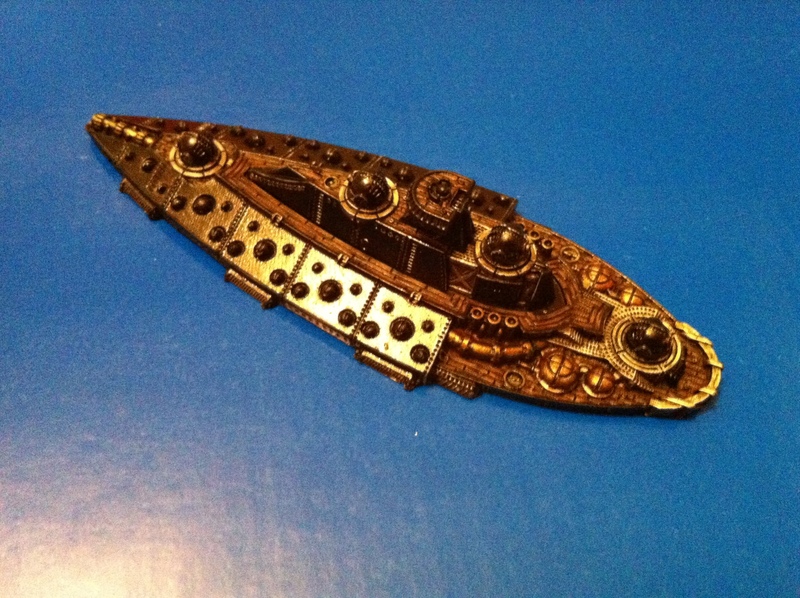 Plus I’m hoping to organise a hobby day with The Chaps to paint Dystopian Wars stuff. But, to be honest, that’s a resolution to do a resolution, which is a little weak. Now this is actually going quite well. The core rules are pretty much finished which means it should be ready for playtesting in the next couple of months. I’m giving myself a slight extension on this so as long as I have Project Awesome completed within my 30th year of being on God’s green Earth I’ll call it a win. 3. Complete the Super Mega Awesome Shell Case Project. This sadly has been canned. For reasons that are too tedious to go into it’s not happening. Sad but not the end. I hope that I can come back to it one day but we’ll see. On the upside; the time can be put into The Shell Case and Project Awesome instead. So it’s not all bad. 4. Make the Shell Case Shorts a regular feature and put togethe an anthology for Christmas release. Well so far so good on this front. It won’t be a Christmas release for the anthology as the competitions are monthly (didn’t think that one through) but the Shell Case Shorts have become a regular feature. It’s been tough finding prizes, or even getting the community to take part but I shall keep at it. Well I’ve certainly been doing that! And I’ve got 3 in the pipeline at the moment. 6. Organise the first, and hopefully not the only, Shell Case Beatdown for all my #warmonger chums. This didn’t really pan out. Again the uptake in the community wasn’t what I had hoped. I might try and arrange a smaller, invite only, version as a starter and then see what might happen after that. 7. 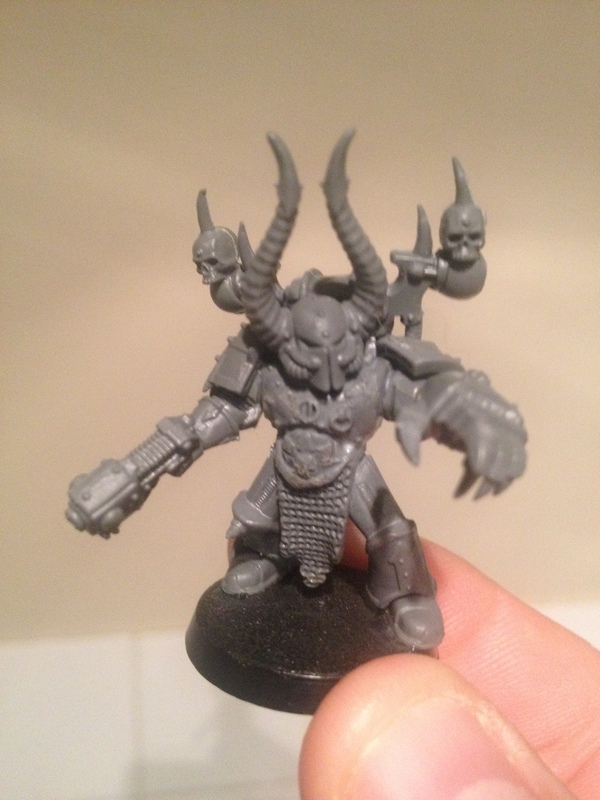 Forgive the Games Workshop. I was doing so well on this one! And then they put their prices up again. To be honest I think I have forgiven, as far as I can. I still play 40k and the Specialist Games range and I love the fiction. I’m just not going to give them my money any more. Not directly at least. With stockists like Total Wargamer offering their stuff at as much as 25% off why by Bonaparte’s balls would I go direct? 8. And finally play a little less xbox and a little more toy soldiers. This is actually going quite well. With the exception of Mass Effect I’ve been all about the toys. That’s been helped in no small part by the reviews I’ve been doing and The Chaps getting into Dystopian Wars. That’ll change when Halo 4 comes out but I’ll worry about that in November. So that’s where I am. My big drive is Project Awesome but fear no The Shell Case will continue on its merry course. And, if anything it’ll be getting a lot busier on the blogging front, but more on that another time. 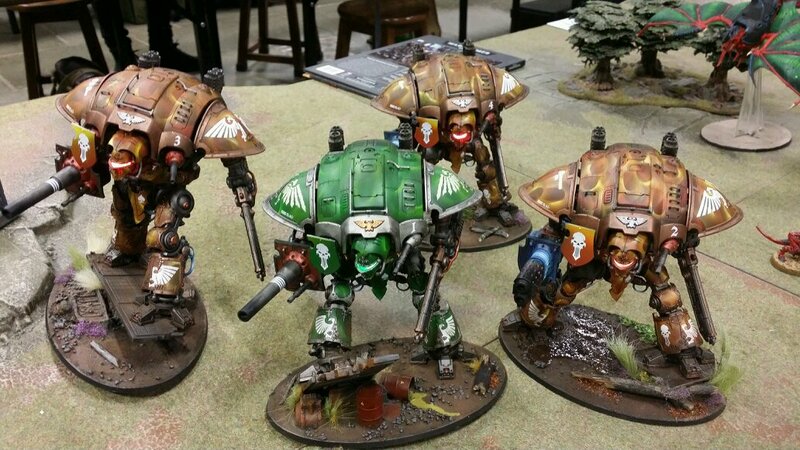 Rob of themossop blog has come up with a rather natty idea in the form of the #warmongers Miniswap. Essentially a community driven co-operative painting exchange. As The Shell Case Alliance is all about these kind of initiatives I’m very pleased to say that Rob is using The Shell Case forum as point of sign up so make sure you get over there and put your name down. A miniswap is a simple idea, everyone who wants to take part puts their name in the hat and then a random draw gives you a name of someone else in the miniswap. 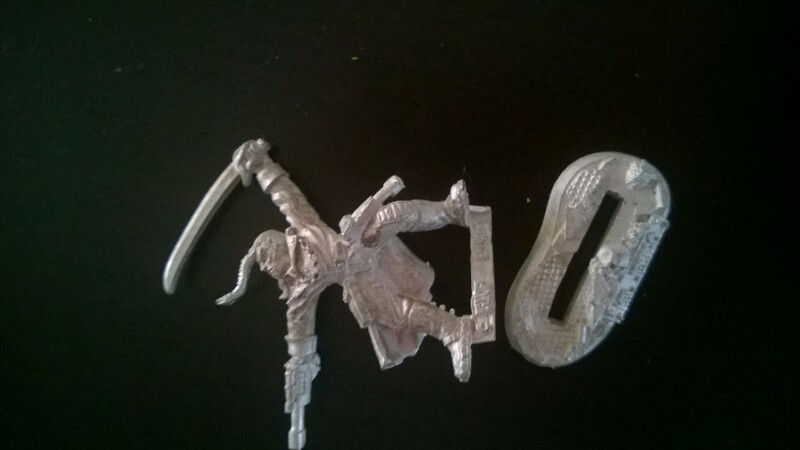 They send you a mini to paint (it’s through snail mail, so a standard 28mm infantry model is probably about as big as you want to get! ), which you dutifully apply your best brush skills to and then return for them to add to their collection. To get involved first head over to The Shell Case forums and sign up, once we have sufficient numbers (a dozen or so) I’ll draw the first names for everyone and post the results, from there it’s up to you to organise address swapping and get the thing moving. Anyone going to Salute on the 21st who would like to be put into a ‘sub-group’ for doing the miniswap in situ, just mention that in your sign up post and I’ll do a pre-Salute draw. We’re doing a #warmongers get together anyway so it sounds like an ideal opportunity to save one batch of postage costs to me! So, what are you waiting for? 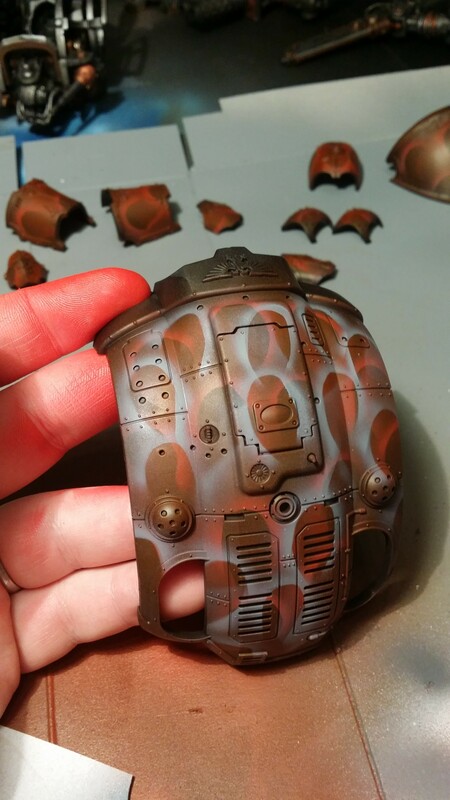 Head on over to the Shell Case forums and get involved, the first annual #warmongers miniswap extravaganza is a go!